We are a manufacturer making a Motorcycle parts and a Car parts. Based in the Bangplee New Town Industrial Estate located on the outskirts of Bangkok, we produce SHIFT SHAFT ASSY used for motorcycles, and various engine parts. With the technology that is always full of originality, KOBAYASHI has contributed to the development of the auto parts industry in Thailand. Our strong field is composite parts which are weld parts composited pressed or machined parts, then machining process are added. Challenge the world of microns. The manufacturing technology of KOBAYASHI AUTOPARTS (THAILAND)LTD. is always asked for a high level of accuracy. Especially machine worked parts, a defect of only few microns' is not allowed, therefore, education to Thai staff is regularly performed. KOBAYASHI manufactures products combined experience in Japan and Thai people's ability, and provides products with the same high quality level as Japanese products. Purchase "satisfaction" for customers is our pleasure. A company led by technical development. 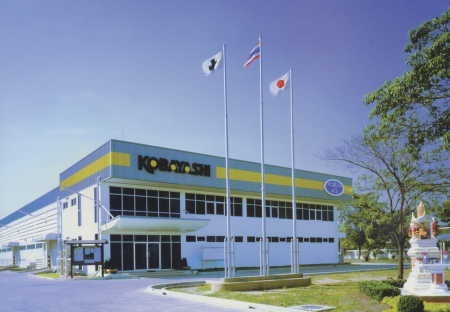 KOBAYASHI AUTOPARTS (THAILAND)LTD. has always considered the environment about establishing a factory and manufacture process. The issue of reducing CO 2 , or exhaust gas from auto mobiles, is strongly proposed worldwide and it is also important tasks for KOBAYASHI. In the future, KOBAYASHI will contribute to reduce environmental problems as to producing the parts concerning this matter. JAPAN (Hamamatsu city, Iwata city), Thailand, Indonesia, KOBAYASHI Group.